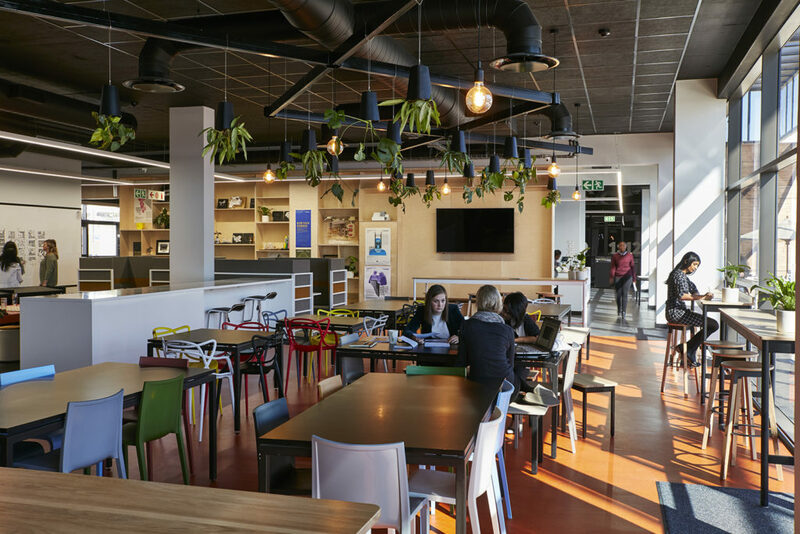 The interior scheme of Boogertman + Partners’ new Johannesburg office, in the Main Straight Office Park in Bryanston, achieved a 5-Star Interiors rating on round 1 of its Green Star submission thanks to a number of innovative green design features. Boogertman + Partners has recently occupied its new Johannesburg office, Building C in the Main Straight Office Park in Bryanston, Johannesburg. The precinct’s Buildings C and D both achieved 4-Star Design ratings in October 2018. Boasting several innovative green design features, the Boogertman Office warmly welcomes visitors into a world of design creativity. 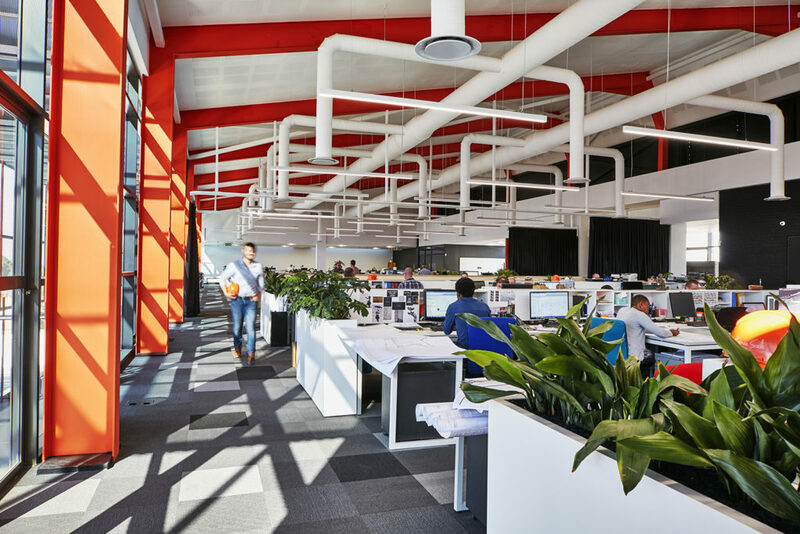 Head interior designer at Boogertman, Smita Waghmarae, worked closely with Solid Green Consulting to ensure the most sustainable material choices were made for the new office space. These choices included locally-sourced reused furniture (from the old Boogertman office across the road), FSC sustainable timber, and flooring containing post-consumer recycled content. The library staircase leading up to the upper level office area doubles as an auditorium; and includes an acoustic curtain which is opened or closed when conferences or staff education sessions are held. 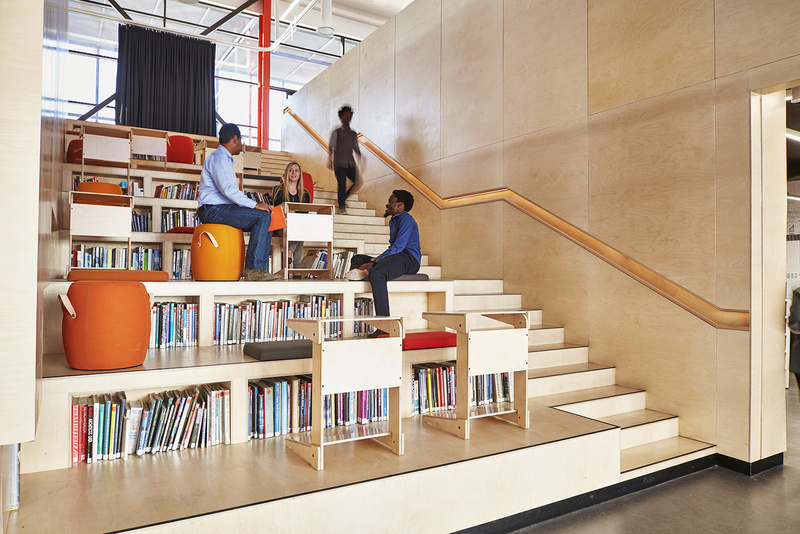 This multi-functional staircase also houses the materials library, which demonstrates a variety of materials to assist with design decisions. Conceptual design for Building C was undertaken by Bob van Bebber, while project director was Quintus van Eck. The building was designed to ensure that maximum daylight entered the space, while ensuring minimal solar heat gains. This allowed for reduced electrical lighting requirements and reduced energy bills. The extensive use of glazing in the design allows for a feeling of direct connection to the outdoor environment, and the inclusion of indoor plants introduces biophilic elements that enliven the interior spaces. All interior lighting utilises LED bulbs and is on occupancy sensors to ensure that unused lighting is switched off, further reducing energy consumption. The canteen area is fully equipped with kitchen and preparation areas where staff can prepare healthy, mindful meals to promote an atmosphere of wellness. Building C also houses a crèche that provides all working mothers at the firm with on-site childcare. Due to budget limitations, all staff members helped to paint this environment thus creating a sense of ownership for all families working at the firm. Building tours are conducted for all who are interested in viewing this innovative office space.